There are many different milestones that a pilot passes during the course of a career. Many of these milestones happen during initial flight training. 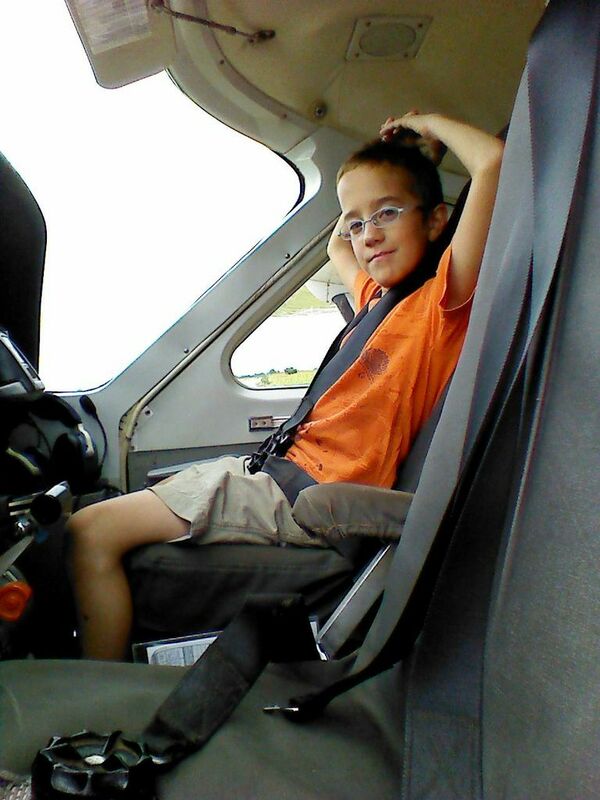 There is the first flight, there is the first solo, the first cross-country flight, achieving their private pilots license, different ratings, advancing their licenses, etc. Once a new pilot moves past these initial milestones, there are fewer and fewer of them that come along. After a pilot has moved into their career and is flying regularly, most of the milestones that pass have to do with flying a new aircraft type or with the accumulation of flight hours. I remember back when I began flying. I would ask my instructors or other experienced pilots that all important question, "How many hours do you have?" Interestingly enough, when I became a flight instructor and was asked that question, my "go-to" response was simply, "Enough." For most pilots, the milestones become the passing of another 1000 hours of flight. I remember my first thousand hours. I was flying the small two seater Citabria aircraft "C-FXRN" out of Three Hills, Alberta. I had my co-worker and good friend Phil Henderson along with me for the flight. It was a fine, sunny summer day with the green and yellow fields of southern Alberta rolling beneath us as I flew. The first thousand hours. Whoa! Good times. The setting for the second thousand hour milestone was a little bit different. I have been trying to take each member of my family with me on an operational flight here in Uganda since we arrived. It helps a lot for them to be able to see first hand what I do every day, and to see the impact and difference that it makes for the passengers that I fly. My son was the last of my family to be able to come along on a flight with me, and finally there came a flight that had both enough space left on it for him to come along and also did not cross international borders, which would have required a visa for him. 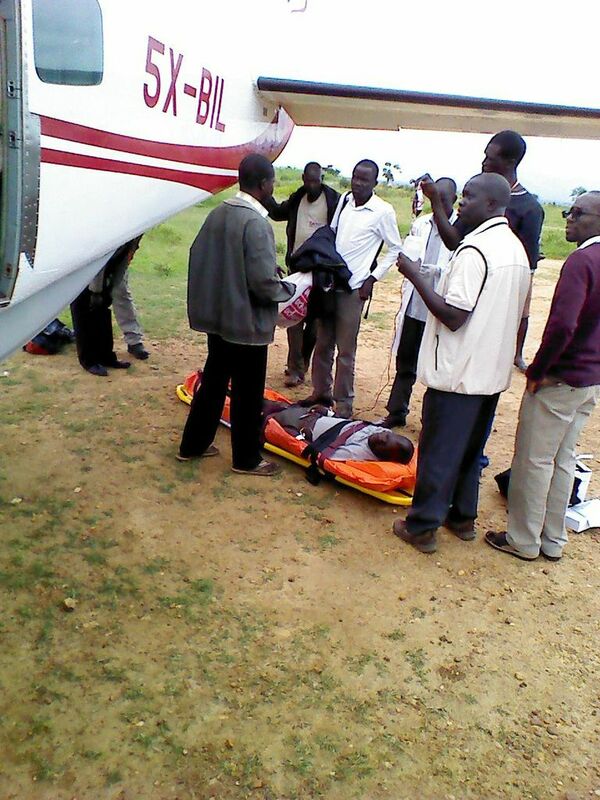 It was planned to be a fairly short flight up to Moroto in northern Uganda, and then straight back home. Usually our flights to the Karamoja region of Uganda have multiple stops, but on this particular day I was only needed to fly to Moroto and back. Drew was excited, and for a change when I popped my head into his room shortly before 6:00am, he vaulted out of bed faster than I have seen him do in a long time. I walked back to the kitchen and checked my phone to see if there were any missed calls or messages during the night. Surprisingly, there was a text message waiting for me. I looked through it quickly and saw that the schedule was changing for my flight that day. At around 4:00am our operations manager had been contacted by World Vision people based in Kotido, a village only about a 15 minute flight from Moroto. 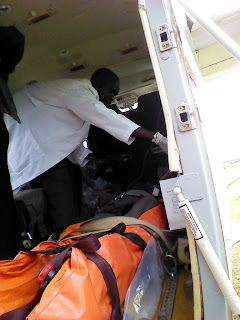 There was a man there who was in medical distress and was needing transport to Kampala for further diagnosis and more advanced medical facilities, could we fly him? Because of the lack of other passengers on the flight back to Kampala (there were only two people scheduled to return with me) there was plenty of room and it was quite easy to arrange to pick this man up. We took off almost exactly at 8:00am. I could sense Drew's excitement beside me as the wheels lifted off of our red murram runway and I banked my plane to the right to intercept my track northeastwards towards Moroto. There was a nice high layer of clouds at around 10,000 feet, which kept it nice and cool in the cockpit as well as very smooth for the flight to Moroto. About 30 miles out of Moroto I was forced to descend so that I was beneath a low layer of cloud, and for the remainder of the flight we cruised at only about 800 feet off the deck. Thankfully, it was also smooth down there and the passengers filling the seats behind be were not subjected to the rough, raggedy ride that usually accompanies flight at such a low level (which can often result in the useage of airsick bags). As my wheels thumped down on the runway in Moroto, Drew turned to me and smiled, "My first landing in Uganda!" I smiled back and taxied up to our parking area. Because I didn't have to take on any fuel in Moroto and my two passengers were there waiting for us, the turn-around in Moroto was fairly quick. I briefed my two passengers on the situation waiting for us in Kotido, and asked them if they were comfortable with it. If not, we did have another MAF plane that would be going through Kotido in a few hours, and if they were not comfortable riding along with the patient it would be possible for them to catch a ride back to Kampala with that plane. They both indicated that there was no problem for them to stay on my plane, so that made things a little easier for the pilots of the other plane. Taking off of Moroto, the low cloud layer forced me to cover the ground between Moroto and Kotido between 500 and 700 feet above ground level. There was no visability or precipitation making things difficult for me, so it was actually a nice little leg to fly, talking with Drew about different things that we saw along the way. We landed in Kotido about one minute behind the other MAF plane that was in that area that morning. They were dropping off passengers in Kotido, then heading further northwards to check out another of our airstrips that has been closed for several months as repairs have been going on there. They were hoping to be able to do an airstrip inspection, then land and walk the strip to check it out from ground level, and then return to Kotido to pick up some passengers for their flight home. Because they did not have any passenger to take out of Kotido on the way north, they were not in a big hurry were able to stay around to help me out with the medevac. We knew that the patient was a "stretcher case", needing to be on the stretcher for his flight. 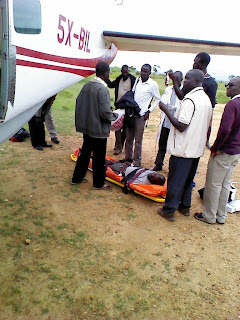 As we began to prepare the plane to accommodate this, the truck carrying the patient arrived at the airstrip. I walked over to check on the condition of the patient, and I was pleasantly surprised to see him stepping out of the truck and walking towards us. I inquired of the attendant if indeed a stretcher was required, and they told me that yes, it would be good for him to be able to lay down for the flight. Because the patient was able to walk, loading him into the plane was going to be easier than we had anticipated as he could walk into the plane and lie down, eliminating the need for us to strap him onto the stretcher and then lift him into the plane. As I turned away from them and hopped into the plane to arrange things inside the plane, I heard a commotion behind me and turned back around. My patient had just passed out and collapsed to the ground. Only his attendants holding him up saved him from a nasty fall. Greg, one of the other MAF pilots there (there were two pilots in the other plane) quickly grabbed our stretcher and laid it out on the ground so that they could lay the man down on it. They did so and we continued to get ready with a little bit more urgency in our actions. Just as we were close to being ready to lift the man into the plane, he sat up a little bit, turned his head, and vomited a large amount of blood all over the ground beside the stretcher. I had been briefed that this had been happening to the patient, but for Drew there were a lot of "firsts" happening all at once, and he was struggling a little bit to process everything that was going on. I had him in the plane so that he wouldn't be in the way, and he was very helpful as he passed us small things that we needed at different times. At one time he turned to me and, with concern in his voice, asked me, "Daddy, have you done this before?" When I answered that yes, I had done this before and that this is one of the ways that we help out the people here, I could see him visibly relax quite a bit. Several minutes later we had loaded the patient and his two attendants in the plane, and my two passengers were also loaded and ready to go. The other two pilots climbed into their plane and headed north, and I breathed a prayer of thanks that they had been there to help out. It always a little bit amazing to me how often God orchestrates these kinds of things. He knows what's going on and knows what we need. Flying home went very well. Because of the loss of blood that my patient was experiencing, I stayed just above the low cloud layer all of the way back to Kampala. I did have an oxygen mask for the patient, but as it is intended to supplement oxygen for a healthy pilot and not supply it for a sick patient, I still stayed as low as possible to provide as much breathable air as possible. After a shallow, 100 foot-per-minute descent down into Kajjansi airstrip, I landed and taxied to our parking spot. Unfortunately, the ambulance was not yet there to meet us, but they did arrive shortly after we landed and the patient did not have to wait too long. Is was a day of many firsts for Drew. His first flight here in Uganda and his first time to see much of northern Uganda. It was his first time to be there to witness a medevac and to be able to have such an obvious example of the difference that MAF can have to the people who we fly. It also gave him a great story to be able to tell his sisters and friends later on. Somewhere in all of that flying that day, I passed my second thousand hour milestone and I can't think of a better way to have done so. It is an honor and privilege to be able to serve God through serving these people and workers here in Uganda. As I often do, I thank you once again for your prayers and support for us here in east Africa. God is working through MAF and through the people who we fly to advance His kingdom and to bring glory to His name. May we all be faithful to serve Him in whatever roll that he has called us to fulfill in each of our lives every day.